According to the National Fire Protection Association, U.S. fire departments responded to an estimated average of 357,000 home structure fires per year during 2009-2013. Cooking equipment was the leading cause of home structure fires and home fire injuries. Smoking was the leading cause of civilian home fire deaths. 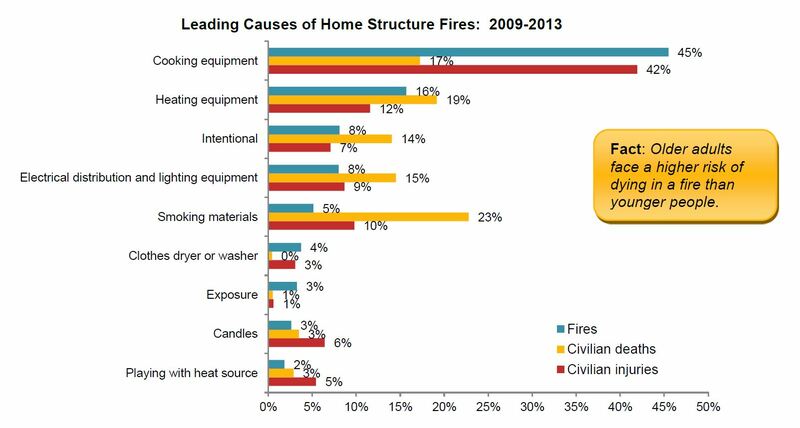 Heating equipment was the second most common cause of home fire fatalities. Estimates were derived from USFA’s National Fire Incident Reporting System and NFPA’s annual fire department experience survey. When a pot or pan overheats or splatters it can take seconds to cause a fire. Stay in the kitchen when cooking. Keep portable heaters at least one meter away from anything that can burn and don’t use your heaters to dry shoes or clothes. Make the bedroom off limits to smoking and never forget to extinguish your cigarette. Never place an ashtray on or near anything that will burn. – Your electrical appliances don’t have loose or frayed cords/ plugs. – Your outlets aren’t overloaded with plugs. – You’re not running electrical wires under rugs or heavy furniture. – You’re not overusing an extension cord. Keep candles in a sturdy holder on a level surface, away from combustible materials and out of reach of children or pets. Children cause fires out of curiosity. Kids may be involved in fire play if you find matches or lighters in their room/possession, smell sulfur in their room, and/or find toys or other personal effects that appear melted/singed. – You have to disconnect one appliance to plug in another. – You have to use extension cords or “octopus” outlets extensively. – Fuses blow or circuit breakers trip frequently. – Lights dim when you use another appliance. Flammable liquids; fuels, solvents, cleaning agents, thinners, adhesives, paints, and other raw materials can ignite or explode if stored improperly. Keep the tree in a stand that will hold 2-3 liters of water, and top it up daily. Keep the tree away from all heat sources, including radiators, furnace ducts, television sets, and fireplaces. As part of regular maintenance, clean removable parts with soapy water. The range hood or vent kept free of built-up grease. Radios, televisions and small electric appliances located safely away from the sink. A list of emergency numbers located prominently near the phone. Grills should be used safely and at least ten feet from your home. If you have a fireplace, use a screen. Make sure the fire is completely out before you go to sleep or leave the house. Dispose of materials used to light or fuel the fire in non-flammable containers. Don’t store anything flammable near the fireplace. Install a chimney spark resistor cap to prevent roof fires. If your home or business in San Francisco has been damaged in a fire, do not hesitate to contact ServiceMaster of San Francisco at (415) 805-9699.